Hiyas my lovely cherry bobbins...wow suns out and looks a fab day...and im feeling so much better cant believe how happy i feel..havent felt this good in ages my lupus meds have settled and im glad to see march..think over half of the UK resident gets SAD..seasonal affective disorder i know i certainly do..but ant sad today although back to work tomoz..deep joy...hope no one bursts my happy bubble......!!!!! god help them...lol!!! It's such a lovely card Sassy,glad you found it!! This is gorgeous and I love the fussy cutting around the image. pleased to hear that you are feeling better, holiday must have helped! Hi Sassy, so glad you're feeling on top of the world hun and glad you found the card and it's gorgeous too. Love the image and colours. 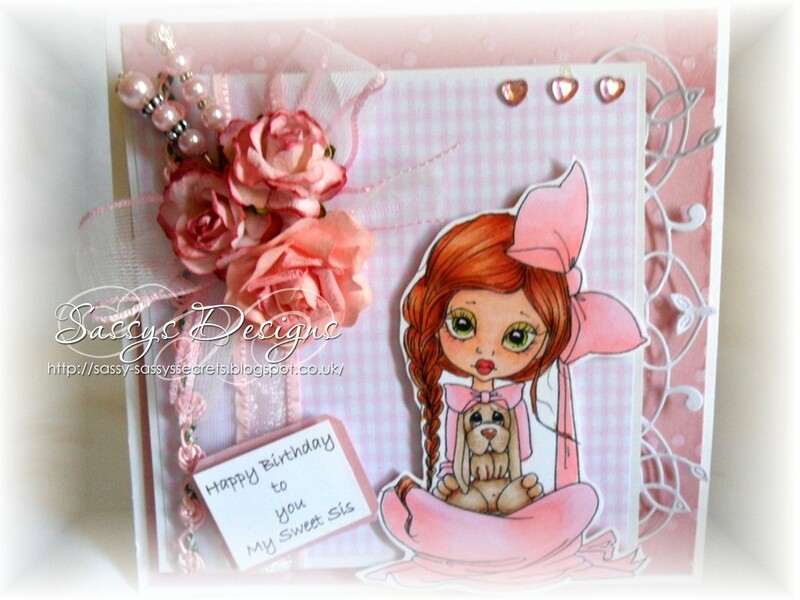 Absolutely stunning creation Sassy, that image is a beauty so are the flowers, awesome card. So glad to hear that you are feeling better Sassy. There will be no holding you now! Adorable card - lucky sister! A beautiful card Sassy. Such a lovely image and coloured beautifully. Finally managed to get round and visit, just not enough hours in the day. Have to agree with you about SAD. I am sure I suffer with it and have felt so much better the last couple of days with this lovely sunshine we have had and the brighter mornings and evenings. Gorgeous card Sassy. I love pretty image and your colouring is fabulous. So glad that you are feeling much brighter. I agree, the good weather certainly lifts the spirits. Love this image, her hair is so very pretty, gorgeous colour!! wonderful card! Glad you are feeling a lot better now hun! Absolutely stunning work Sassy .. .. I am sure it is going to be well loved!! Your post just made me smile many times Sassy lol. I love your gorgeous pink card. Hope you are still feeling happy and no one rocked your boat. 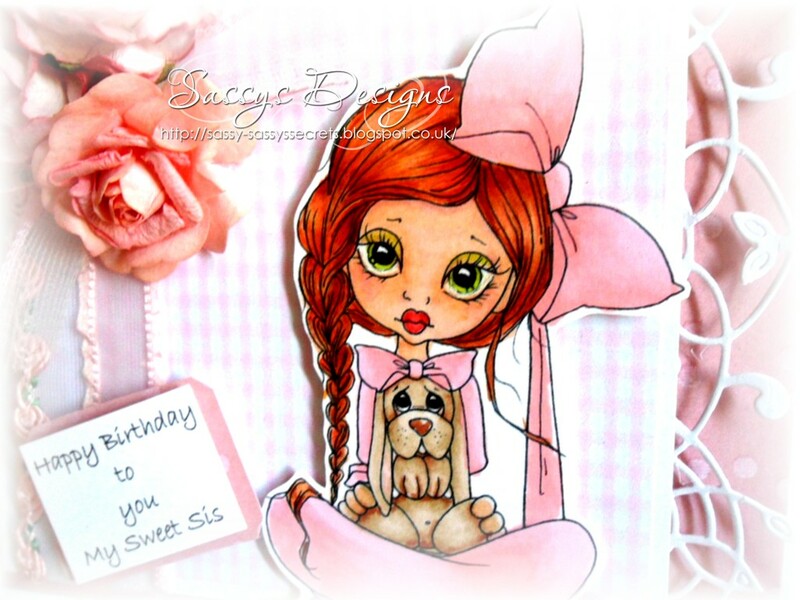 A gorgeous card Sassy, your image is adorable and so beautifully coloured. Your papers and details are stunning! !